Prisoners in Dachau forced to stand without moving for endless hours as a punishment. After Hitler came to power in early 1933, the Nazis began a systematic roundup of political opponents and all known anti-Nazis. There were so many arrests that conventional prisons quickly became overwhelmed. A series of 'wild' concentration camps were hastily constructed by Nazi storm troopers which were often little more than stockades surrounded by barbed wire. Once inside, prisoners were subjected to harsh military style drills, random beatings and sometimes torture. Nazi storm troopers often held prisoners until family members could gather enough money to ransom them out of the camps. Thus began a lucrative practice of hauling off prisoners and holding them until ransom was received. These early, crude concentration camps were not the centralized, streamlined institutions they were later to become. The SA and SS, along with various Nazi agencies and local Gauleiters all controlled 'wild' camps and sometimes resorted to actual shooting to resolve disputes. In March of 1933, SS leader Heinrich Himmler became Police President of Munich and decided to construct a new SS run concentration camp at an unused munitions factory located twelve miles northwest of Munich on the Amper River. This factory in the town of Dachau contained old stone huts which were converted for use as a receiving area for prisoners who had been taken into protective custody (schutzhaft). Upon first entering Dachau, a prisoner passed through an iron gate that bore the cynical Nazi slogan, Arbeit Macht Frei, meaning works sets you free or work liberates. Inside the camp, painted along the roof of a building facing the prisoners' huts was the slogan: "There is one way to freedom. Its milestones are: obedience, zeal, honesty, order, cleanliness, temperance, truth, sense of sacrifice and love for the Fatherland." 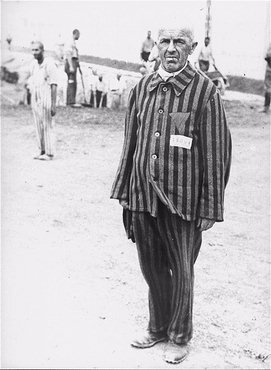 Most of the inmates during the early days of Dachau were political prisoners. These inmates were never told how long they would be imprisoned, a factor that had severe negative effects on their morale and overall mental health. Often, their arrival at Dachau marked the first time they had ever been arrested or involved with police. Many had been taken into custody by the Nazis on vague accusations or denunciations by persons who disliked them or perhaps wanted to settle a score. Upon being hauled away the bewildered detainee would be told: "Based on Article One of the Decree of the Reich President for the Protection of People and State of 28 February 1933, you are taken into protective custody in the interest of public security and order. Reason: suspicion of activities inimical to the State." Inside Dachau the prisoners lived in long wooden huts (blocks) with each hut housing 270 inmates. The interior of each hut was divided into five rooms, each containing two rows of bunks, stacked three-high, sleeping a total of 54 persons. The huts lacked adequate sanitary facilities, containing only twelve lavatory bowls for all 270 men. Each morning at roll call, the 54 men of each room paraded together as a platoon. The five rooms, or groups of men, formed a company, with a 'sergeant' prisoner responsible for discipline. Every aspect of a prisoner's daily life at Dachau was regulated, from how guards were to be saluted, to the required precise alignment of the blue and white checkered bed sheets to form perfect parallels with the sides and ends. Following roll call, the prisoners would be marched off to begin their 12 hour workday in a camp workshop or outside along the camp grounds. The long hours combined with poor nutrition and inadequate sanitary facilities usually produced rapid weight loss and a general decline in a prisoner's health. This harsh, forced labor system was the model for all subsequent concentration camps as Himmler and the SS sought to take advantage of a ready supply of slave labor. By the end of the war in 1945, Himmler had established a mini-empire of SS owned factories and war industries located around concentration camps throughout the Reich. "There behind the barbed wire lurks the enemy and he watches everything you do. He will try to help himself by using all your weaknesses. Don't leave yourself open in any way. Show these enemies of the state your teeth. Anyone who shows even the smallest sign of compassion for the enemies of the state must disappear from our ranks. I can only use hard men who are determined to do anything. We have no use for weaklings." Rudolf Höss, the kommandant of Auschwitz who was trained by Eicke, later commented that Eicke had "no human understanding for the prisoners as a whole" and that Eicke's SS guards developed "a hate, an antipathy against prisoners which is inconceivable to those outside." The shaven-headed prisoners in dirty striped clothes were numbers, not persons, stripped of their humanity and individual personalities. They were referred to as "pigs" and "filth" and other obscenity laced names. Jews were referred to as "filth-Jews" or "trash-Jews." Upon first entering the camp and being registered, a Jew would be asked, "The name of the whore that shitted you out?" - to which they had to give their mother's name or be beaten. Regulations drawn up by Eicke included the standing order that any prisoner would be hanged who "politicizes, holds inciting speeches and meetings, forms cliques, loiters around with others - who for the purpose of supplying the propaganda of the opposition with atrocity stories, collects true or false information about the concentration camp, receives such information, buries it, talks about it to others, smuggles it out of the camp into the hands of foreign visitors, etc." A further regulation stated any prisoner would be shot on the spot or later hanged for refusing to obey any order from an SS man. Those who were shot usually had their deaths listed as "shot while attempting to escape." Routine punishments for prisoners included; forcing them to stand completely still for many hours (shown above), beatings on the block, whippings with 25 lashes and solitary confinement in tiny, stand-up prison cells, too small to sit in. Eicke was also strict with his SS guards, berating and punishing them for the smallest infractions. But along with the harsh discipline, Eicke made a habit of fraternizing with his men down to the lowest ranking SS troops and was thus well liked, earning the SS nickname "Papa Eicke." Many of the SS officers trained under Eicke went on to become kommandants and senior officers at future camps and extermination centers, including Höss. Based on the early success of Dachau, in 1934 Himmler made Eicke the first Inspector of concentration camps. Most of the smaller 'wild' camps were eventually shut down and replaced by larger ones built on the Dachau model including Buchenwald in central Germany near Weimar, Sachsenhausen in the north near Berlin and Ravensbrück for women. The existence of these early concentration camps and the rumours surrounding them instilled a nagging sense of fear among all Germans and effectively suppressed any political opposition to Hitler and the Nazi regime.